Bramble Rose pounded in the last stake and stepped back in satisfaction, looking up at the large tent. It was a pale tan color, with a central pole and four corner poles, all the bits of fabric nailed down to the rough ground. This was going to be his home for the next few months! Sure, it was a bit basic, but in the back of his mind, it was something more. Rising ghostlike behind the tent, in his imagination, was the Bramble Rose Environmental Research Institute. A modern structure, full of beautiful plants and white walls and clean rooms and dedicated towards better understanding how all different sorts of natural magic flowed together. Ah, it was a dream. A dream years and years in the future. But this was the first step: An honest-to-goodness research grant, and research site. To his right was the normal rolling fields and wooded copses of the landscape around Ponyville. To his left ... the torn-up, blasted and bare dirt and rock left barren by the fight between Tirac and Princess Twilight, the unimaginable levels of magic involved having devastated the area. It was a dream come true. Princess Twilight had generously granted them a huge pile of bits, all for scientific research on the Tirek's Waste! For his scientific research! Admittedly, he'd also gone through some ... rather harrowing and embarrassing situations for the princess, but it was all worth it for this moment. He'd met some interesting scientifically minded ponies through Ingrid Marie, and had brought in a few more from his contacts in the University of Canterlot, and he'd even been able to bring along a research assistant in his friend, Flitter, from Ponyville! His happily dating another mare friend, Flitter, with whom it would be extremely inappropriate to flirt. His memory shied away from the embarrassment he'd suffered at realizing that misunderstanding. Anyway! He turned to face the assembled ponies, smoothing over the olive vest full of useful pockets, taking off the broad-brimmed hat that protected him from the sun. Half of the ponies he was looking to were the scientists and researchers of various fields he'd been able to gather to help him in this amazing opportunity. "Filles and gentlecolts! I declare this research site open ... for SCIENCE!" He got a brief, blazing flare of excitement in his eyes, and was unable to keep his grin from getting just a little *too* wide. Then he settled down, and turned to the other half of ponies assembled. The nice delivery ponies who were helping all the scientists with their gear. "Yes, thank you so much for waiting. If you could just start moving the crates and boxes carefully into the tents? that would be wonderful. They should each have a number on them, yes, we hung the numbers on the tents." He passed off a few bits to the forepony as a tip. "And if you wanted to open that crate in front there, first? That'll be some nice cold ciders for your workers to enjoy. Dry and thirsty work, carrying crates in this sort of weather!" Smiling felt almost unnatural to Bevel as she tried desperately to suppress her inward glee as she joined this group of fellow intellectuals on this journey. It would be something she could use to take her mind off her repeated failures at repairing the immense damage sustained by the Zephyr. At this point it was getting depressing. Now matter what way she tried to fix the broken vessel it just fell back into the two sections again... she had to get The ship working again! She had to. Perhaps the use of a mending spell would help the repairs but then again the damage from the mass teleport drive had made the wood itself magically unstable to be able to move or hold with telekinesis, but enough about her ship. Unlike the vast majority of the ponies in equestria at this time, Bevel gear was in fact not in the country when this Tirek went on his rampage.From what she'd heard it was horrifying but somehow the stories of the terrifying experiences didn't seem to phase the mare as much as others. from what she'd heard of how Equestria worked, everything wrapped up and was fixed after about, thirty minutes at best. At worst, maybe an hour. She approached the stallion at the front and spoke up, calmly, in a professional manner. "Mister Rose, I personally went through the equipment and calibrated it so it should perform perfectly well. If there is any issues with readouts please tell me... I have also brought some things that could make the moving of the boxes easier for us all." Flitter was late! Laaaate! That was bad enough, but she had actually been invited to assist in research with actual scientists out in the field! Not merely as a student in on a class trip, but as part of the actual research team! How much more impressive was her application for the PhD program at Canterlot University was going to look with bonafied, published research! It was a golden opportunity and what does she do on her first day? Oversleep!! Sure, she was up until early in the morning preparing notes, equipment, and supplies, but that was no excuse. Not on the biggest day of her life, well, alright, not the biggest, but definitely in the top five! What also may have made the young peagsus mare a little late was her trying to decide what to wear. Normally she wasn't much into worrying about that sort of thing, but she wanted to impress! At least, before it dawned on her that she'd be working outdoors in dirt and rain and whatever else nature threw at them. After all her vacillation, she didn't wear anything extra past her saddlebags and a floppy straw hat. Her mane was in pigtails instead of her normal ponytail, and her signature bow was instead tied to the base of her tail, which she figured was just as good. She couldn't forget her good luck charm! As she looked down over the wastes outside of town, she quickly spotted the sizable gathering of ponies in the mostly set-up camp. Ugh, she really was late! Out in front of the group was the familiar purple unicorn - Bramble Rose, her research advisor. She quickly dove down towards him. Late! 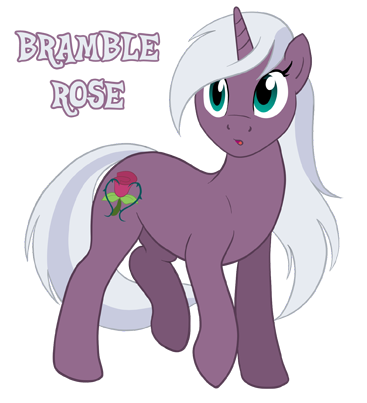 Crashed into Bramble Rose, the pair tumbling for several feet before coming to a rest at the hooves of several delivery ponies. Their laugh and make and raucous whistling made her very aware of the awkward display: Flitter laid splayed over Bramble, her nose almost touching his. 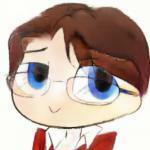 She blushed fiercely with an awkward, apologetic smile, "ummm... Hiiiiii Bramble? Mr. Rose?" Another enthusiastic voice joined in the shouting; “FOR SCIENCE!” That voice belonged to Moondancer; student of Aetherology at Canterlot University and a de facto guildmaster of Spellbound, Canterlot’s on-the-rise magic guild. The young mare came all this way today for two reasons: one, because she’d get the rare opportunity to lend her spellcasting abilities in the name of researching a magically scarred battlefield, something which will look good on a future resume! The other reason: Moony had actually met the guy running the expedition once during the Spellbound Hearths Warming Gala. Bramble Rose and Moony might not be close buddies yet, but that wouldn’t stop the moon-flanked unicorn from assisting a friend of Spellbound’s. Moony didn’t look too different than her usual self... except for the ponytail her mane was sporting. And the pair of trendy glasses she was wearing. The young mare figured that since she was very close to the end of her graduate-level studies, now would be a good time to start experimenting with her usual look to present herself as somepony other than her usual carefree self. Today was one such opportune moment to try Moony’s new appearance out in public! Bramble grinned hugely, feeling proud and at least a half a foot taller as a number of ponies came into greet him and congratulate him. He nodded and exchanged polite small talk, the way his dam had taught him, including them in the celebration and success of this endeavor. He smiled to Moondancer as she came in. "Glad the Guild is interested in this research. I'm sure it's going to bring in a lot of new knowledge." And Bevel was here, too! He was looking forward to her congratulations, but as he might have been expected, she was straight into business. Though the brown mare was looking perhaps a little happier today than usual, and she was looking especially cute with that little band-aid on top of her nose. He grinned and clasped her on the shoulder with one forehoof. "Thank you, Bevel, your gear is top-notch. I'm sure all the labor ponies are going to be ever so grateful for your time-saving devices. I don't know what we'd do without the attentive care you have been giving to our-"
"Whaaaa... " there was something rather ... fuzzy ... in front of him. And the world seemed to be tilting slightly. Someone should probably be recording it. Perhaps a local alteration to the gravatational field due to magical misalignment. The world didn't usually spin, right? Except in the broadest sense of the word... He couldn't seem to focus on whatever that object was. But he heard Flitter talking to him from somewhere nearby. Oh, wait. He couldn't focus because it was an inch in front of his face! Flitter! He heard the wolf-whistles, and his face turned a bright red. He cleared his throat awkwardly. "Ah-heh. Hello, Flitter! Um." He cleared his throat awkwardly. "That was a close call. Not that we're close! I mean, other than the crash. Perhaps we should stand up?" The hoof on her shoulder made her jolt in place for a moment... but afer a moment she gave the stallion a nervous half smile. She opened up a small square box at her side. It had a strange pattern over it: small grooves around it's entirely glowed faintly, the light inside shifting as faint shadows of gears and the sound of winding came from within. Once the cube shaped box opened up, a few small strange little brass colored creatures rolled out. Upon closer look they weren't flesh and blood creatures but complex, clockwork creatures of the crustacean theme. There were all smaller than a pony's head but there were about twenty of them and they all scuttled over to one of the heavy crates and working together they carried one of those large wooden cubes over to the a spot designated by an enthusiastic looking worker. Once they brought it over they repeated the process. "They all add up to about one extra pair of hooves really but they won't need a break for a long while, Monsieur Bramble Rose!" The mare's normally deeper register seemed to go a bit higher as she spoke, the smile on her muzzle growing by small measurements until she leapt a good foot in the air as the stallion she was speaking to was practically tackled to the ground. From what she could see he was alright and so was the mare who tackled him. Given this strange comfort at being so physically close to one another, Bevel could only assume the two were associates or in some such other relationship. 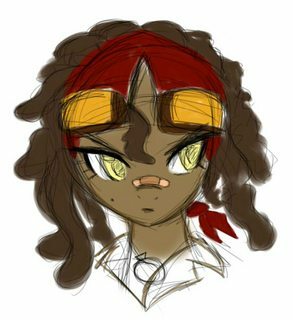 Bevel put on her more 'respectful' face and cleared her throat, "Indeed I think our head researcher has an admirer... also, your teleportation has definitely improved since I say you at the academy." She looked to herself, "I'm still only up to maximum number of teleportation of... three, when not aided by my inventions." The inventor looked sideways and coughed into her hoof before setting it down and continuing, "How many blinks have you managed so far? By the way, You've changed your manestyle. J'est très jolie." In Moondancer's time reacquainting herself with the inventor she would have noticed the recurring instances of fancy speech being peppered in a few of her statements. It seemed to be a habit she was having little success in ratifying. Curiously though, with each visit and nicety from the aetherology student, she might have noticed her new friend's coat was growing strangely brighter in tiny increments with each visit. The only real change to the inventor's wardrobe was a simple cravat she's started to wear. She was thinking a bit more about her wardrobe though since she'd come to ponyville... but that was neither here nor there. First impressions... Except for flitter this was crashing right into head researcher of this project, Bramble Rose, and laying on top of him, muzzle to muzzle like some cheesy bit store romantic novel cover. Flitter's face turned as bright a red as Bramble's, her hooves flying to cover her muzzle, her wings flaring to boost her to her hooves. "Oh! Oh no! I'm sorry, Bramble! Rose! Professor Rose! Sir!" Desperately, she grabbed hold of his forehooves and yanked him to all fours, except she was flying and he was so small and lightweight, so it was more of an 'all none' of his hooves on the ground, and it brought his face entirely too close to her face again, that wasn't what she meant to do! Instinctively she dropped him and jumped back again. "I mean, um. I mean, I'm sorry. I'm kinda nervous, just I'm so excited to be here with you! Professionally!" She hesitated, looked around. Oh no. Wolf whistles, flustered everything, everyone watching them. Knowing smirks. This was a nightmare! 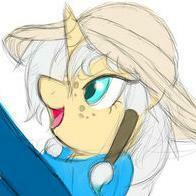 Hesitantly, she pulled off her saddlebags and fetched out some small, pale blue sacks with darker blue ribbons. "Um... I brought... trail mix? Also equipment! And paper, so I can take notes, so I can learn! Oh, this is the worst first impression EVER." 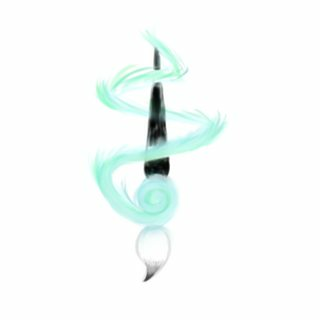 @Pretzelpony : Sorry, I had absolutely no idea what Bevel was trying to say about teleportation, and my Internet connection is to unstable to ask for clarification over Skype, so I'm just posting my reply as is. Moony brushed a hoof through her hair, choosing not to stare any longer at Bramble and his pegasus friend in their humiliated state. "Oh, it's nothing really," Moony laughed off what she thought was supposed to be a compliment from Bevel; not everypony knew Prench like the inventor. "I might try another look sometime; just to explore the possibilities, you know? Heck, I'd even go for an old-school sorceress get-up if I got something like... say, the deed to the Ivory Tower as a grad present, tehehehe." The unicorn mare could see herself now, reading scrolls in the place where the historic Magic Guild of old held meetings. Although the converted warehouse was nice and all for Spellbound's hangout, wouldn't it be awesome to reoccupy the Ivory Tower and be like... well, a real Magic Guild? "I see you're making changes to your look as well," the moon-flanked mare winked at her pal, pointing towards the cravat; "When did you start wearing that thingy?"